On December 26, 1896, Harriet Hosmer wrote one of the loveliest thank you notes I have read to Cornelia Crow Carr. Carr and Hosmer had gone to the Sedgwick School together in Lenox, Massachusetts, and by 1896 they had been the closest of friends for 5 decades. The precious box came safely yesterday afternoon all in time for Christmas and laden with all the precious things my precious had the loving thought to send me–never in 50 years have you failed my precious friend to remember me on Christmas Day–Wherever I am your love and ceaseless goodness follow me–far and near the loving thoughts stretch out to me on Christmas Day–yes and all days. And then all the pretty gifts are so useful–the very things I want. That is the charm of a gift–not only its usefulness but the thought that absent friend is so much a part of yourself that she knows exactly of what you are thinking and what wishing for–again my precious I thank you for the lovely gift . . . This letter inspires me to put more effort into my thank you notes this year–certainly to do more than fire off an e-mail. Beginning January 1, Book Club Girl is hosting a read-along of all of the Dobbs mysteries, leading up to the release the newest book in the series, A Lesson in Secrets, in March. I’ve read them all except the Mapping of Love and Death, and now is the perfect time to dive in. I can’t wait to discuss these books with other fans. On January 6, I will be giving a talk at the Watertown Free Public Library at 7:30. The library owns several of Hosmer’s works, as well as her sculpting tools and a collection of her papers. The staff there was very generous and helpful as I worked on the book, especially in allowing me to use images the library owns. 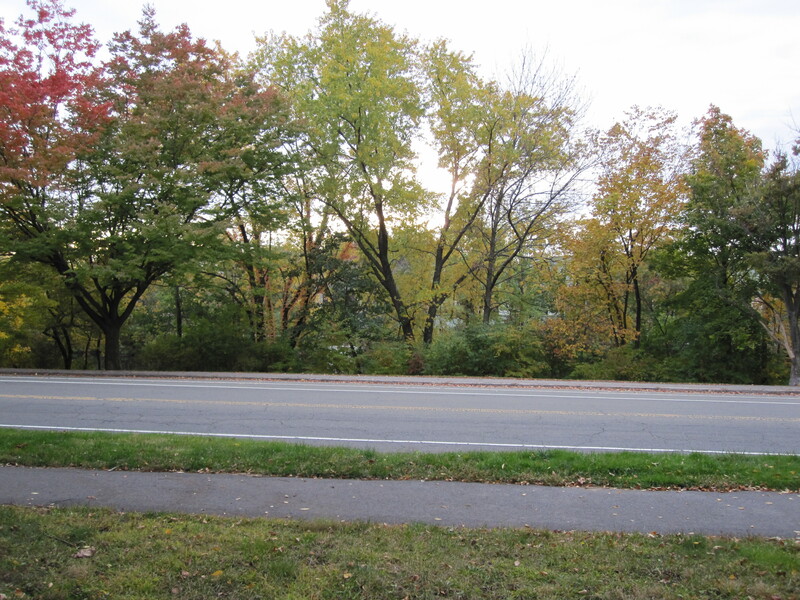 Hosmer’s childhood home, which no longer exists, was just a few blocks away from the library; below is a picture of what I approximate to be the view of the Charles that she would have had from the house. Yesterday, I visited the Metropolitan Museum with some old friends. I had always hoped the Met gift shop would carry Harriet Hosmer: A Cultural Biography, as the museum collections include Hosmer’s Daphne and one of her Clasped Hands of Robert and Elizabeth Barrett Browning. The store even sells a replica of the Brownings’ hands. I was thrilled when I did find in on the shelves; it was the first time I have physically seen the book for sale somewhere. 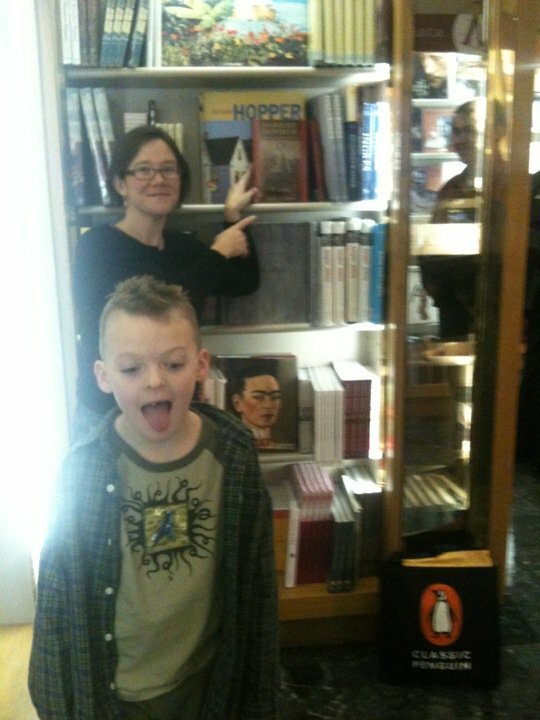 Below is a picture of me, the book, and my young buddy Ben; Frida Kahlo looks a little skeptical of us all. One of the main themes in my biography of Hosmer is the ways she and her supporters shaped her image to make her acceptable to her nineteenth-century audience. As part of this project, Hosmer made sure never to seem too ambitious or angry in public. But in private letters a different picture sometimes emerges. When she was in contention for the commission to sculpt a memorial to Missouri senator Thomas Hart Benton, for instance, she reveled in the thought of “collapsing the flues” of her competitors in Rome with the news of her victory. When she did win, she reported that her friend Shakespeare Wood regretted one particularly jealous contemporary was out of town so Wood wouldn’t get to witness “his horrid grin of anguish” at the news. Of course, Hosmer eventually took what she called the “wise & prudent” route of gracious acceptance. Still the snarkiness was there, and therefore I think she would have really liked author Anita Liberty’s new line of Fair Anger Jewelry. Simple and lovely pendant necklaces come with themes such as Confidence: Imbues with the confidence to knowledge to know you are, in fact, always right. And Contentment: Amplifies your feelings of superiority and self confidence. Hosmer, ever confident, would have coveted that one, I believe. Thanks to everyone who came out to the Hoist a Pint to Harriet event. I believe a good time was had by all–at least I had a great time. A jazz band playing the final hour of the party made it even more festive. I will be a guest on the Z. Travel and Leisure Hour on WVOX 1460 AM in New Rochelle on Monday Dec. 6 at 8 PM. The hosts are Susan and Art Zuckerman. If you are not in the area, you can listen online.